The name "coquí" is frequently used to describe about 16 different species of amphibians that fall under the genera Eleutherodactylus in Puerto Rico. It is also the scientific name of one of these species in particular. (Eleutherodactylus coquí) This last species is also the one that's most commonly found throughout Puerto Rico. The name comes from the song that the male of the species is often heard singing in the forest. What it seems to say is: "cokeé, cokeé". That's why it is called "coquí" in Spanish. The coqu� común varies greatly in coloring and markings. Some have lines or bands that go down the center of their backs. Others have lines on their sides and some of these also have lines going between the eyes. Of course, with such wide variations, it isn't surprising that often people will confuse these frogs as coquies of different species. These frogs are probably most known for their abundance in Puerto Rico. However, some Puerto Rican species have also been introduced to other countries. Coqu� com�n lives in some gardens in Florida, USA. Coqu� Chur�, has been take to Panam�. In addition to these man-made introductions of the species into other habitats, there are more than 500 species of Coqu� from M�xico to the North of Argentina as well as in the Caribbean islands. In the Greater and Minor Antilles there are over 120 species of Coqu�. Only in Puerto Rico is this group of frogs called Coqu�es. In other countries they have other names. In Cuba they are called Colines. This picture was sent to me by a Frogland visitor. 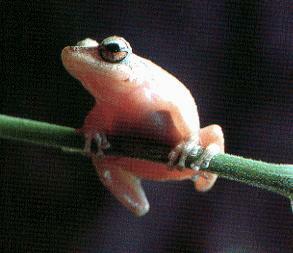 Alien Frog Species in Hawaii lists the coqui as a species of frog that was unnaturally introduced to Hawaii. Other than the fact that these are pretty noisy frogs and this bugs the locals, there are also some real legitimate concerns that such man-made introductions can disrupt the natural balance of wildlife there. HawaiianCoqui.org/ - an alternate viewpoint, that speaks of Hawaiian love for the Coqui. "We are currently conducting a "Kisses for Coquis" Campaign in Puerto Rico, getting people to send chocolate kisses to our governor to help stop the frog war. (Puerto Ricans LOVE the coqui. It's their national animal.)" This group claims that "the local eradication interests have been whipping up hatred forthe frogs to encourage funding for control efforts. Ironically, the sound is so loved in Puerto Rico that many people take recordings of the coquis with them while travelling to help them sleep! And many Hawaii residents also love the sound."